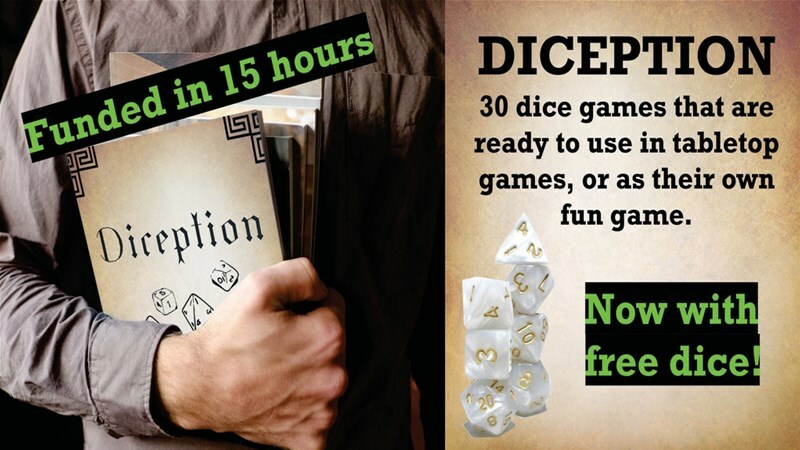 Diception is a collection of minimalist mini games for use in tabletop role-playing games that are easy to learn and fun to play using only the dice you already have!! It's about having fun while someone digs through the rule book, rolling dice with or against others at the table and adding another level of immersion to your game world! When your hero is sitting in a tavern and someone breaks out their dice to play a game of "7's" or the bar keep challenges them to a game of "Heroes Risk" you can play for real! The campaign is well over its funding goal with 9 days left to go.